A new image shows a star, roughly 1,400 light years from Earth, preparing to die — and the moment is sad and beautiful. 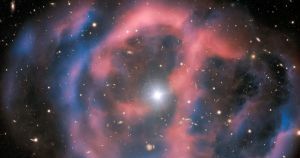 On Tuesday, the European Southern Observatory (ESO) released a new image of a star called ESO 577-24. Once a red giant, it is now an extremely hot dwarf star surrounded by a planetary nebula — a stunning cloud of glowing gas that will slowly expand and grow dimmer as the star dies. Like organisms here on Earth, stars evolve. The red giant phase is the stage of evolution after a star runs out of the hydrogen fuel at its core. At that point in its life cycle, gravity begins to contract the dying star, causing it to shrink. This reignites the star’s core, causing it to cast off its outer layers. These layers shine due to the ultraviolet radiation emitting from the core, producing the glowing planetary nebula we see in the ESO’s image. We’ve known about the planetary nebula surrounding ESO 577-24 since the 1950s, when the National Geographic Society’s Palomar Observatory Sky Survey discovered it. The ESO’s Very Large Telescope captured this new image of the celestial phenomenon as part of the observatory’s Cosmic Gems Programme. The purpose of that initiative is to generate stunning, high-quality images the ESO can use for education and public outreach — and this gorgeous vision of a dying star taking its last breath certainly qualifies.